I have refused your app for a visit because Iam not satisfied that you meet this requirement paragraph 4.2( a-e) appendix V immigration rule for visitor. I note that you intend to visit UK as tourist for 11 days. You state you are employee at xyz reputed firm as a senior engineer earning 44000 inr ( around 444 euros) per month since 02/09/2015 .Your proposed expenditure on this amount 4000 euros is not commensurate with Your income as I did not find it credible that you would spend almost 10 times of your income on this short visit.I therefore not satisfied that your intension to visit UK is not as stated. 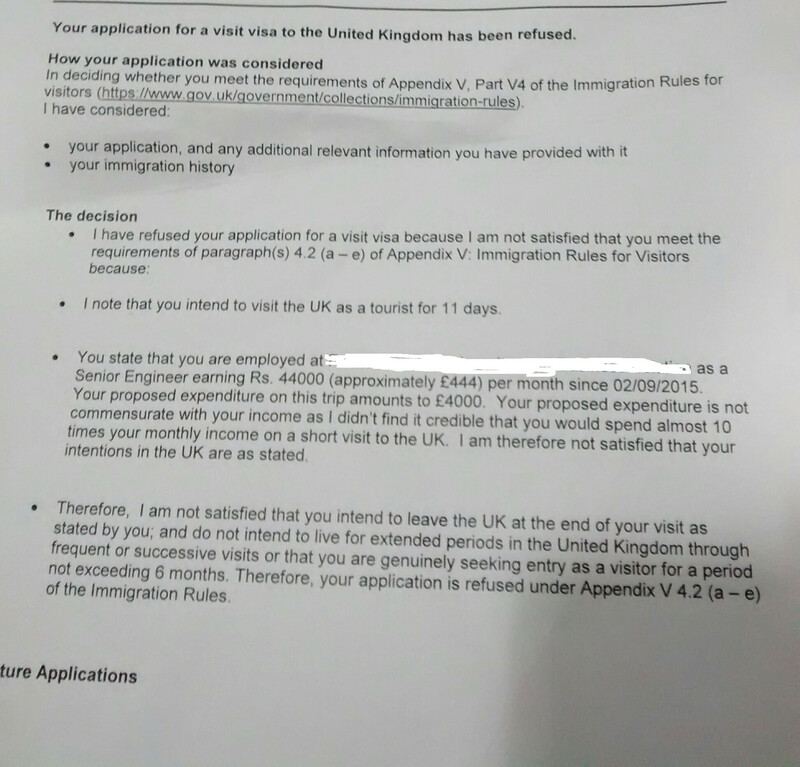 Therefore iam not satisfied that you intend to leave the UK at the end of your visit as stated by you.This was the information given in the refusal note. People who visit the UK and genuinely expect to stay for a short period of time do not commit their entire financial reserves or spend almost a year's wages. It's disproportionate and signals that the application should be examined more closely. In your case this (and other factors) attracted a refusal. You got hit on V 4.2 (a-e), which is about as severe as you can get without outright deception or a criminal history. Essentially the ECO doesn't believe you really have GBP 4.4k to support yourself and that you will go underground and try to work illegally. This will be difficult to correct and would not be fixed by simply telling the ECO you will spend less money. Normally there would be a paragraph describing your personal circumstances or they would not have used sub-paragraph (d), but it's safe to assume that something in your personal circumstances set off an alarm. Nothing in the refusal notice you provided indicates that sub-paragraph (d) was an appropriate ground so we cannot help you uncover and fix it. Also... These sorts of refusals are normally accompanied by a paragraph on "provenance of funds". They wouldn't use sub-paragraph (e) otherwise. It might be missing or you may have not transcribed it into your question. If so, it would be important. Your actual question got thrown overboard in all the various edits, but originally you asked "what are necg steps can I take pls suggest". Given the severity of your refusal, I would emphatically suggest not making a fresh application right away. They will almost certainly refuse it. Your next step is to examine if a visit to the UK is appropriate for you at this particular point in time and if it is consistent with your apparent life-style. If so, then you should define a premise that makes your visit credible. I suggest reading the information on this site about provenance of funds. Once you have assembled those, it would be worthwhile to arrange a consultation with a UK solicitor who operates a practice area in UK visitor visas. You will not qualify for free advice or legal aid, but you may find the outlay to be massively beneficial. Now having had sight of your actual refusal notice (you uploaded a scan), I admit the possibility that you may have been scammed (as suggested by DJ Clayworth, to whom thanks). This would be especially true if you applied using an agent or other type of 3rd party. While there have been no reported instances of VFS itself operating a scam, there have been similar operations both at home and abroad. If you used an agent, you will need to contact the Home Office directly to see if your refusal is genuine. The ECO's failure to support his grounds V 4.2 (a-e), especially (d) and (e). In all events, scam or not, a refusal notice with these two characteristics should attract a grave complaint. There is no recourse for appeal, but you are entitled to a fair and complete refusal notice in order to bring corrective measures to bear.